Despite our quickly graying skies, falling temps and threats of rain... I still love Fall... fleeting though it may be. I try not to share this sentiment aloud until we are well out of our summer stint... usually a couple of great months of brilliant skies, verdant landscapes and a warmth that trumps the ever-dependable dampness we know so well and even the most web-footed Oregonian is conditioned to accept but is willing to temporarily forgo. For a few short months (weeks, even), I relish the changes that Fall brings... the crispness in the air, the sometimes uncanny blue of the sky, the billowy white clouds, puffed and proud, the unbelievable beauty in the changing colors of the season, with leaves ranging from iridescent yellows to fiery reds. It's a season that demands boots, sweaters, scarves... and soup! 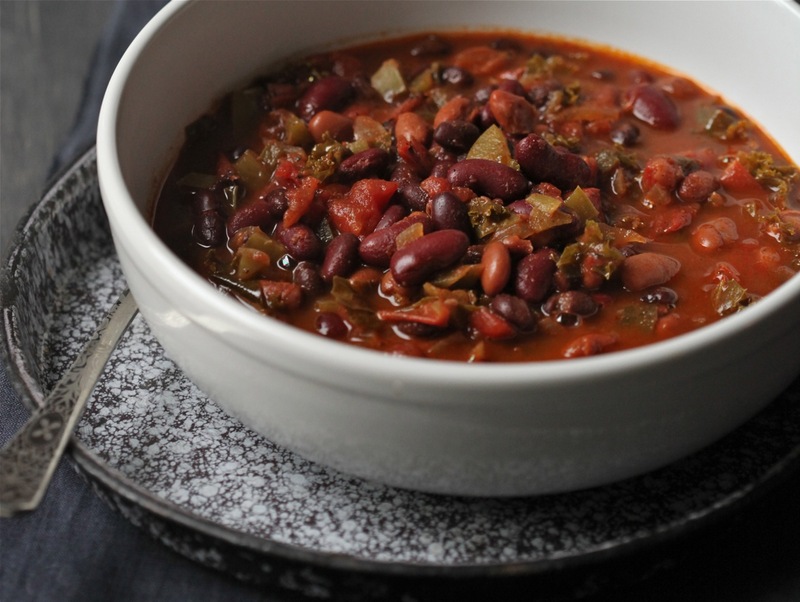 This particular recipe is for a chili... not a soup... but it counts, nonetheless, in my book. 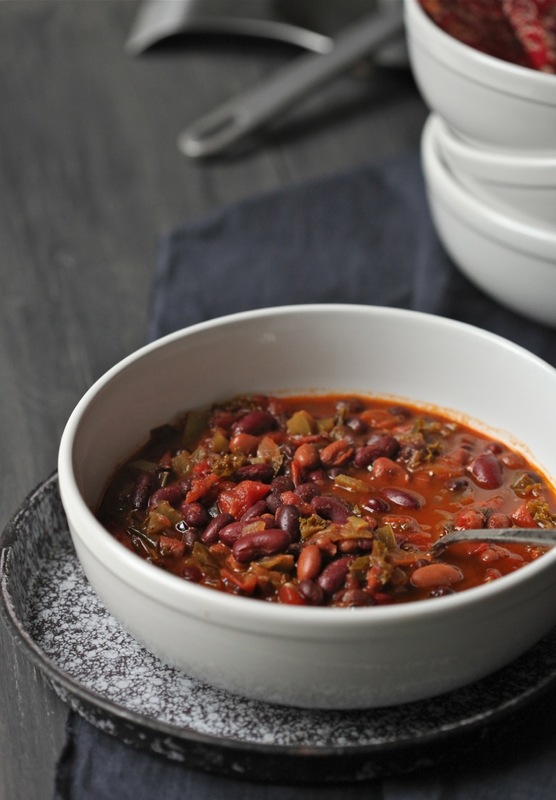 It's a satisfying chili... easy to make, and quick to the table... 30 minutes tops! Though I don't necessarily relish the goodbye of summer, or the short, sweet season of Fall disappearing into what can sometimes be a long, damp winter (and oft times a non-existent Spring), I do love the fact that soups and chilies will blissfully buoy us until the season again turns to sun and warmth... then Fall, again. In a large dutch oven or heavy soup pot, heat olive oil over medium heat. Add onions and bell pepper; sauté for 2 to 3 minutes, until translucent. Add kale and continue to sauté, turning intermittently, until wilted; about 2 minutes. Add beans, chili powder, paprika, salt, and pepper; mix through. Add tomatoes, water, canned chilies and red pepper flakes. Simmer on medium low for approximately 20 minutes, to allow flavors to meld and chili to thicken a bit; stir occasionally. Season with additional salt, to taste.